France: A group of men in balaclavas carrying batons and tasers attacked students occupying a lecture hall at Montpellier University. Some of the attackers have also been identified as faculty members. 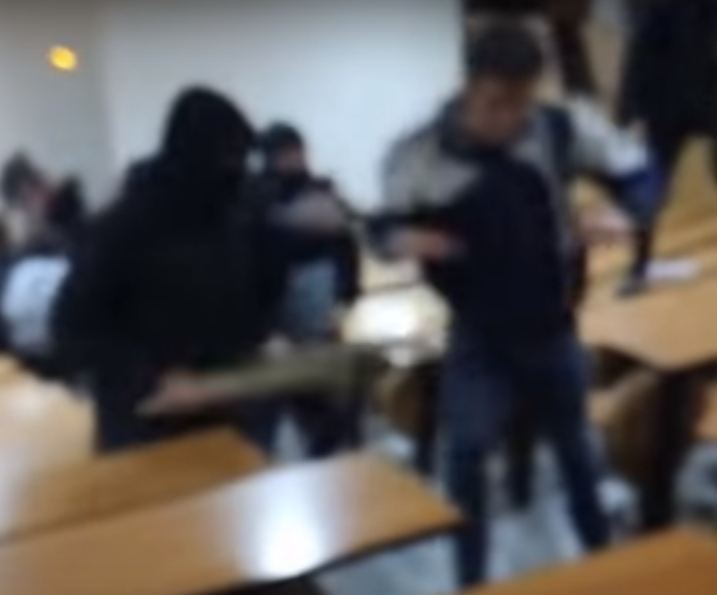 Yesterday ultra right-wing masked teachers attacked students inside #Montpellier University. The attack took place late in the evening, after a national day of strikes and demonstrations organized by public sector unions. Students all over France had joined the marches, protesting against a recent law which establishes a form of selection at the entrance of universities. The student movement, which started on February 1st, led to a wave of occupations in universities in Toulouse, Bordeaux, Lille, Strasbourg, Tours and Paris. Some of these occupations led to police interventions, like in Bordeaux, where students were beat up by riot cops on March 7. But in Montpellier, where police apparently refused to intervene when a group of students occupied a law faculty lecture hall, some of the men who attacked the students have been recognized as faculty members. A far-right blog also attributed the attack to the GUD, a violent fascist group. Four students were hospitalised, including two with serious skull injuries. Solidarity with #Montpellier: No fascists on campus – Enough is Enough! Paris: Fascist attack against Tolbiac University – Enough is Enough!